I don’t know if you feel the same way, but sometimes I like to indulge on appetisers and really don’t feel like eating the rest of the food. Appetisers are delicious, they offer an array of flavours and textures. I almost never feel the need for main course when there is a selection of good irresistible appetisers. Now while we still want to cook a main course, we all know and love to have a proper appetisers buffet in our Iftar gatherings. So I have put together this post with a collection of my most favourite appetisers for you to choose from for your appetisers buffets. Whichever options you go for, or even all of them for an elaborate buffet if your time/guest list allows; you are going to have an irresistible selection! What appetisers buffet is complete without the good old Hummus (recipe on this link) and Mutabal Beitinjan (recipe on this link)? These two are the pearls of Arabic Cuisine’s appetisers selection. 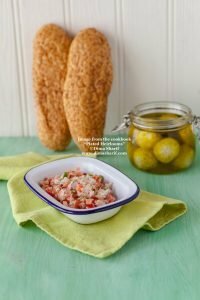 Not only are these two good on their own, but they also serve as dippers for Arabic Samboosik and Fried Kubbeh. Another option would be Nutted Labneh. To make Nutted Labneh all you need to do is crush toasted walnuts to resemble coarse pieces, mix in with the labneh and a little salt. Place all in a serving dish, drizzle with my exquisite organic extra virgin olive oil and sprinkle with my beautiful Sumac. Serve cold. Make a variety of these purees and dippers and place them at the front of your appetisers buffet. There are many very well known salads in Arabic Cuisine, such as Fattoush (recipe on this link), Tabbouleh (recipe on this link), Zaatar Salad (recipe on this link), Jarjeer Salad, Carrot & Beetroot Salad (recipe on this link)… you can go for a selection of these salads (choose the flavours to go best with the main you are serving). Along with that selection why not serve this amazing Beetroot Salad with cherry Vinaigrette (recipe on this link) everyone loves this super fresh salad. It goes very well with all meat dishes, as well as alongside seafood. It is always nice to offer something different. For a different presentation of the salad section on your buffet, why not go for a make-your-own salad option? I think it is always a good idea to place assorted bowls with chopped raw vegetables with assorted dressings (like 3 basic dressings) on the buffet to allow guests to create their own salad. So what I would do on a Ramadan Appetisers Buffet is have the beetroot salad ready made, and a tabbouleh as it is specific in preparation. Then I would place different vegetables in bowls, some toasted pita bread in a bowl next to the vegetables, some cubed feta cheese in another bowl. 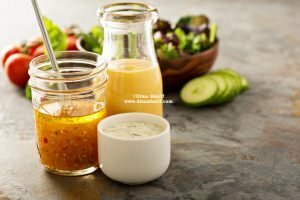 In small pouring jars, I would have a basic vinaigrette, and of course my olive oil mixed with some lemon juice, dried mint and seasoned with my sumac, salt and black pepper for one dressing and a balsamic vinaigrette for another dressing. You can also add a bowl of toasted and roughly chopped walnuts, and some fruit bowls if you like. This way my guests, get to have a say in what salad they like to have and those planning to eat less of the rich foods get to have an option for a variety of salads to fill them up. Place the Salads on the middle part of your buffet. Every appetisers Buffet must have at least one fried appetiser. The most common are the Meat & Cheese Samboosiks. There is also Fried Kubbeh (the same as that used to cook in the yogurt sauce, except fried and not cooked in the sauce), as well as the succulent Fried Cheese Rolls. I also love to include a platter of assorted fried vegetables such as eggplant slices, zucchinis, cauliflower and sweet potato slices simply fried. Next to this platter I place a bowl of Tahina dip (recipe on this link) which guests can use to drizzle over the fried vegetables. If you make these small (bite size) they can be a very elegant option on an appetisers buffet. 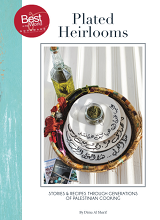 There is the Sfeeha, the Arabic Spinach Pastries, the Potato-filled Pastries, Zaatar pastries among others to choose from. The sfeeha (recipe on this link). Hot appetisers are an art in Arabic cuisine. There are many options offering many flavours and experiences! There is the famous, simple yet really delicious Allayet Bandora (recipe on this link). A similar dish but with the addition of green beans is Loubyeh bil Zeit (which can be served hot or cold, recipe on this link). Not to forget the super tasty Stir-fried Chicken Giblets (recipe on this link), the Samkeh Harra, the Grilled Halloumi, Yalangi (recipe on this link), Fool Mdamas (recipe on this link), Arayes (recipe on this link)… just to name a few! The variety is endless! Choose the ones that compliment your overall menu, and you can choose as few or little as you wish. These are the jewel of the crown, my absolute favourite part of Arabic appetisers. all are delicious in their own right! And these are just the tip of of the iceberg! Make one type that compliments the flavours of the rest of your menu, and place it on your Buffet! When you think of a Buffet always think of the flow of flavours. Make sure that the options flow well together. The buffet must be colourful and therefore appealing to the eye. It also has to be a variety of textures. Nothing more boring than a buffet offering all mushy creamy textures only! It has to offer the comfort of purees, the crunch and freshness of salads, the warmth of the hot appetisers and the cool of the cold ones. It has to be a full rounded experience, and nothing does it better than a good Appetisers Buffet. 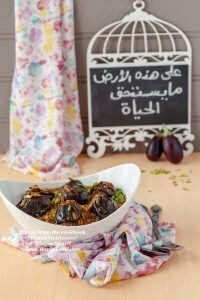 Don’t forget to take pictures of recipes you carry out from this blog and share them with me for a chance to win prizes, part of my Ramadan Special. See other readers’ creations here… For more details, please visit this link. Don’t forget to express gratitude this Ramada, your loved ones will love feeling appreciated! Everything looks very delicious,I am so hungry for it..I have question for if I may: do you braise or boil the Stir-fried Chicken Giblets before you stir-fried it?its very chewy and it takes long time to cook?Thank You. Hi Macopollo 🙂 I have simply boiled them in water, as mentioned in post to prepare them for the cooking and infuse the aromas. The method in the post results in very well textured giblets, not a never ending chewy texture. Give it a try you will see for yourself. All those who have tried this recipe loved it and had only good things to say, so I am definite that it will come out fine when done at home. Dima – everything looks so delicious – and the spread is hugeeeee! Haven't been able to keep up with your daily posts because of so much of activity here in kolkata – my loss completely! 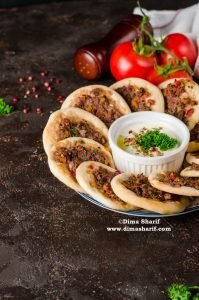 Hummus, Mutabal,samboosik,Fatet Djaj, Foul Mdamas, Arayes, Alayet Bandoura, Pastas, Harira soup, Stuffed Potatoes, salads, dips….etc are some of the heavenlty dishes and appetizers that Your Blog has inspired me to do. Never to forget the useful tips and comments that never fail to guide any quality, elegant, and high end result food-seeker!